Coffin Turbo Pump, Inc. (CTPI) performed a design review of its DEB-16 two-stage boiler feed pump design using Computational Fluid Dynamics (CFD) analysis software and identified pump-end design improvements that have achieved up to a 5% reduction in turbine steam consumption by the replacement of select internal parts that can be replaced during a typical in-situ pump overhaul. 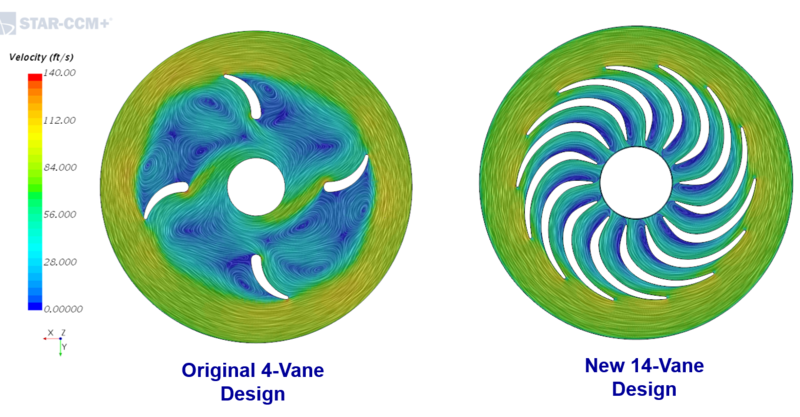 Modification: Increased return channel vane count and improved vane and flow passage profiling. Improvement: Increased pressure recovery through the diaphragm. Residual flow swirl is removed prior to entry into the 2nd stage, improving the 2nd stage impeller work output because of the of the streamlined flow. Modification: API 610 compliant non-galling continuous carbon fiber/PEEK2 composite assembled onto impeller inlets and wear sleeves to reduce inter-stage leakage between stationary and rotating wear surfaces. Improvement: Reduced hydraulic leakage losses through the rotating v. stationary wear parts. The ~5% reduction in turbine steam consumption corresponds with a similar reduction in required pump brake horsepower, thus yielding significant fuel savings. A payback period of 1-3 years is expected depending on actual system characteristics. With actual customer-supplied performance data and operating conditions, CTP can perform an Estimated Savings Analysis to better predict the fuel savings and payback period of your system’s Efficiency Upgrade. 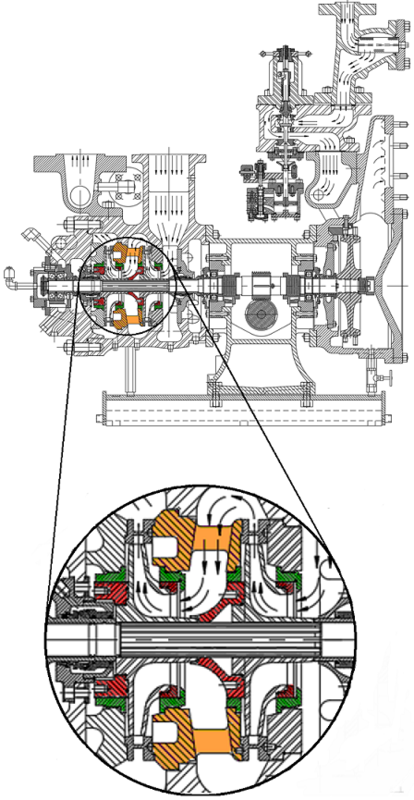 Additionally, the reduction in turbine steam consumption enables the pump to run slower, reducing the wear on key wear parts between recommended maintenance overhauls. Don’t hesitate to reach out today for a quote and Estimated Savings Analysis of your your new Efficiency Upgrade Package! Replace the 2nd stage pump diaphragm (orange). Not a typical replacement part, but once replaced can expect a 20+ year service life. Replace all wearing rings (green) and impeller inlets & wear-ring sleeves (red). These wear parts are typically replaced during pump overhaul.